Pacific Coast � Double Down Surround � pillows are named for their two layers�the inner small-feather/down layer and the outer layer of soft down and feathers. This unique pillow-within-a-pillow design ensures luxurious head and neck support for the best sleep of your life�every night. 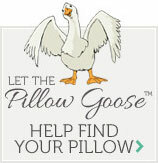 Pacific Coast � Double Down pillows are perfect for side or back sleepers.